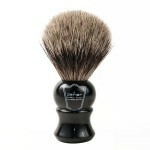 This pure badger bristle shave brush is an incredible value. The badger bristles are high grade and will provide many years of satisfaction. The brush knot is extremely dense and soft and will create an extremely rich lather when used with a high quality shave soap or cream. Includes a free shave stand for proper brush drying/hanging to ensure years of use. 100% Pure Badger Bristles for a great Lather! Extremely soft and absorbant bristles! A “must” for preparing your face for a smooth and luxurious shave! Outstanding Quality – for years of service!